The thought of having an entire class devoted to “discussion” can seem daunting, especially if you didn’t have elaborate class discussions during high school. Participation is required in most college classes, but have no fear! Read on for an overview of what to expect, as well as how you can and why you should rock your participation grade. What is a discussion class? Some discussion classes are also called seminars. These classes may have only 10-20 students, and students are expected to learn from each other as well as the professor. Discussion classes, or sections, are also typically a required component of a large lecture class. They offer a time when smaller groups of students (typically less than 30) meet with a graduate student instructor, teaching assistant, or professor to review class content, go over questions, discuss the readings, and do some additional work. Discussion classes also offer an opportunity to connect with classmates about the larger course, which is hard to do in a lecture hall of 200+ students. Depending on the course you’re in, discussion classes can take different forms. For example, in a science or math course, you’ll likely use discussion class time to complete problem sets. In a liberal arts course like English or political science, you’ll be more likely to use that time to review lectures and discuss the readings. What is the point of a discussion class? From the perspective of your instructor, discussion is valuable because it gets you - the students - active in the learning, which makes you more likely to understand and remember the material. Do I have to participate in my discussion class? Check your syllabus, but participation in your discussion class is almost always factored into your course grade for overall class participation. Discussion is usually taken into account with other things like attendance, turning in assignments on time, and completing online discussion prompts. Discussion section allows the instructor to put a name with your face, which can be invaluable because it allows you to differentiate yourself in a smaller pool of students. A discussion is only as good as its participants. If students are unprepared, tired, or disinterested, the discussion will suffer. Over time, your instructor will recognize and remember the students who contribute. Whether you’re one of them or not, you’ll see that reflected in the grade you receive at the end of the semester. What if my participation shows that I don't understand something? That's OK! Professors aren't just looking for the "right" answers. They know that students learn best when they try out ideas and make mistakes and ask questions. It's good to be as prepared as you can, but the expectation is that you will ask questions and share your ideas, not that you understand everything perfectly. Participating in a discussion class doesn’t start in class! Know the material. Do the readings and assignments, and review previous lecture notes before the discussion. This provides the foundation for being able to contribute. Write down questions on ideas and concepts you don’t understand. Professors love it when a student asks a question in a discussion section! Practice answering the questions “how would you summarize the readings?” and “what did you think about the readings?” These are the two most common questions instructors ask at the beginning of a discussion class. Write down 3-5 talking points. What are your top three takeaways from the reading or assignment? What do you agree or disagree with? Does it relate to something else you already studied in the class or to current events? If you're very nervous, practice what you want to say. Talk through your notes verbally. Ask yourself questions the instructor might ask the class, then practice possible answers. Sit in the front, visible to the instructor. It will be easier to get their attention to make a comment or ask a question. Go for the low hanging fruit. As the class is getting warmed up for discussion, you might as well answer the easy stuff. The longer you go without getting involved, the more difficult you may find it to contribute. Commenting earlier on will also ensure that someone else does not comment or ask the question you were planning on asking. Participate, don't dominate. You want to be an active participant, not the only participant. Don’t get hung up on sounding like Einstein. Be yourself. Nervous about participating? Imagine you’re only talking to one person. You might even direct your body language toward one person in the room to start, like your instructor or a fellow student. Extra nervous about participating? Avoidance is not the answer, especially if you want a good grade. Start by contributing a short comment or posing a question. You can share longer comments as you become more comfortable over time. Don’t be afraid to say “I’m not sure” or “I don’t know,” but don’t use it as a security blanket either. After a few class sessions you’ll be able to anticipate the flow of the discussion class. You’ll also have a better sense of what types of questions your instructor will ask, as well as what they expect from students in the class. Satisfied with your participation? Great! Keep it up. Looking to improve for next time? If you're not sure how you're doing, or how to improve, try going to office hours or arrange a time to talk to your instructor outside of class. Approach them at the end of class or send them an email, and let them know you’re having a hard time making contributions to the discussion and that you’d like to talk with them about ways to improve. 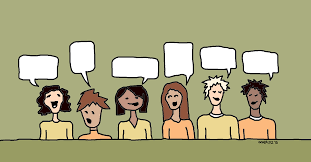 When you meet up, talk about two things: (1) ways you can get more involved in the discussion, and (2) ways your instructor can help you get more involved in the discussion - maybe they can ask you a question or ask for your opinion as a part of the natural flow of the conversation.